■HTBasic 10 running under Windows XP, Vista and Win7 is the fastest and most efficient way to code in the Rocky Mountain BASIC (RMB) environment yet. One-click access with toolbars, pull-down menus, dialog boxes, undo and redo makes intuitive RMB programming easier than ever. HTBasic 10's windows-style editor with features like bookmarks, user-definable fonts, coloured keywords, and syntax error identification that allows programmers to navigate and edit even the largest source code with ease. Toggling off line numbers eliminates inefficient programming limits without sacrificing programming ease. 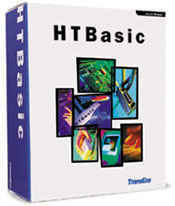 Users of any earlier version of HTBasic can upgrade to the current version.